International Calling* and Unlimited Carryover† available. International Calling* and Unlimited Carryover† available. x2 Airtime for Basic Phones and x3 Airtime for Smartphones for every Airtime card purchase. *Basic International calling to over 100 destinations. †Service must be active and in use within any six month period. Plans and phones/SIMS sold separately. Airtime Service Plan required for activation. ‡To get 4G LTE speed, you must have a compatible or unlocked 4G LTE smartphone. Actual availability, coverage, and speed may vary. LTE is a trademark of ETSI. Includes a limited amount of high speed data per cycle. The amount of high speed data provided varies based on your plan selection. After your high speed data is used, your data speed will be reduced for the remainder of the cycle. High speed data is restored once a new 30 day service plan is added. Other limitations, terms and conditions of service apply. §The $10 Global Calling Card must be combined with another Tracfone Service Plan to work. International long distance service is available to select destinations only, which are subject to change at any time. Calls must originate from the US or Puerto Rico only. No international roaming allowed. Only for personal use. Calls are billed in one-minute increments. Airtime minutes will be deducted plus the cost of the international call. Rates are subject to change without prior notice. Card benefits expires after 180 days or last use or 30 days after your service is suspended, whichever occurs first. Available online only. 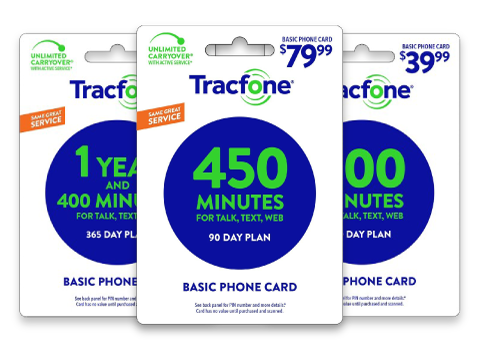 Get all of your talk, text and data tripled on every plan and pay-as-you-go card you purchase with an active TracFone Android™-powered device. Sign Up For Tracfone Wireless Today!